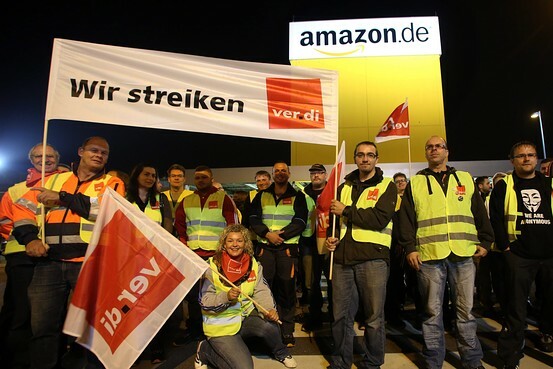 BERLIN — A union has launched a three-day strike at five Amazon.com distribution centers in Germany, the latest in a string of walkouts in a long-running wage dispute with the American online retailer. The ver.di union called workers at Bad Hersfeld, Leipzig, Graben, Rheinberg and Werne out on strike from early Monday until late Wednesday. It didn't say how many people would be involved. Amazon has more than 9,000 full-time employees in Germany. The union has been pushing for higher pay, arguing Amazon workers receive lower wages than others in retail and mail-order jobs. Amazon says its distribution warehouses in Germany are logistics centers and employees earn relatively high wages for that industry. Amazon said customers can expect punctual deliveries despite the walkouts in the pre-Christmas period, news agency dpa reported.